We’re thrilled to launch the 2.0 version of our WordPress plugin. With hundreds of new users every week, we’ve been listening to the user feedback and are happy to launch our new version which is way more easy to use. The WordPress Landing Page plugin is designed to help users publish landing pages to appear as a natural extension of their WordPress websites. Just to be clear, all landing pages are built on our site and are hosted on our site. However, when you use our plugin, you will be able to publish the page on your WordPress website domain and so your website visitors will see the page as a part of your website. Just in case you are using versions 1, 1.3, 1.4 or 1.5 we recommend that you upgrade to the latest version. However, I’ve left the previous How-To article at the end of this blog in case you need it. For the version 2.0, you can continue reading here. 1. Install the plugin on your wordpress site. You can find the Sunny landing page plugin here. 3. Once installed, click on Sunny Landing Pages on the left menu. If you’re a new user, you will be prompted to create a new account and the button will redirect you to the Sunny Landing Pages website. Otherwise existing users can login using their username and password. Now the next step is for you to build your landing page. I won’t get into too much detail on that over here. 5. Once you’ve selected WordPress, you’re now ready to head back to the Sunny Plugin dashboard in your WordPress admin section. You will see all your pages in our plugin page. By default, all pages are in Draft status. So there are two quick steps left to do. 6. Finalize your URL. Click on Quick Edit and you will be able to change the URL to anything you want. 7. In the same screen change the Status to Published. So, as you can see, if your page is ready it only takes minute to get the page published on your WordPress website. Isn’t WordPress the coolest thing, ever? One the best things I like about WordPress are the plugins and extensions. First, Why do you need a landing page on WordPress? Whether you are a serious web publisher, a blogger, an ecommerce seller or an advertiser, chances are you need to build landing pages to convert your visitors to subscribers or to leads or to customers. The quality of your landing page will define your cost per click and conversion rates. 1. Singular Call to Action – when someone comes to your wordpress site or blog, they are going to look at your top menu and side menu navigation and get distracted with all the options. Marketers now realize the need for designing landing pages with a singular call to action to improve conversion rates. 2. Lead Notifications and Management – When someone signs up on your landing page for a newsletter or expressing interest in your product, then you want to get an immediate notification and set up triggered actions such as an email autoresponders, sending a text message, giving a call back etc. Sunny Landing Pages offers a drag and drop builder giving you mobile-responsive, fast-loading, high-converting landing pages. You don’t need a designer or a coder and it takes a few minutes to customize a template from our vast template gallery. The platform offers easy integration with all leading marketing automation and SaaS platforms via Zapier. 3. Once logged in, select a template from the gallery and make the changes you want. You can see a quick demo video here. 5. You will now be able to see your page in the WordPress plugin interface in the drop down options in Add New. 6. Create a page URL and then your page will display as a natural extension of your main website. You will need to build your landing page on our builder and then publish it to your wordpress site. The builder has a drag and drop interface for you to place the elements anywhere on the page. Within the page, you can divide the page into multiple horizontal sections. Each section gives you several options in terms of background image, color and pattern. You can define the height of the section. You can add/ edit/ delete any headline of the page with pre-formatted options H1-H6. The WYSIWYG editor provides your standard features – bold, italics, underline, font size, font style, font color, spacing, alignment, numbering and bullets, indents, hyperlinks, tables and custom HTML. It has a handy undo and redo feature as well. Add a background image for extra punch. Images of real people make your landing page more credible, warm and attractive. Especially if your page has an image which your target visitor can relate to. Now you can make cool designer kinda effects on your images without having to use Photoshop. We’ve integrated Adobe’s Creative Cloud so that you get a whole bunch of image / photo editor features. Images and Videos rule the social web these days. For videos, the builder makes it easy for you to embed a youtube or a vimeo video. All you have to do is enter the URL and presto! Your video is embedded. The call to action comes down to a user clicking the landing page button. So you better make it one heck of a button! The builder allows you to customize the interactions with your own thank you message and you can redirect user to another page after they click the button. For styling the button, the builder lets you edit the color, image and padding. It let’s you add in your own button text, and format the text. Once you’re done you can align the button to anywhere on the landing page. A one-click addition of popular fields like name, email, phone etc. Create custom fields of your choice from many options such as radio, checkbox, dropdown, URL, text area etc. Use pre-validated popular fields such as name, phone number, email and it gives you appropriate error handling. Text labels can be given on top of the input boxes or hidden away if you would like. The form labels can be formatted with font-color, font-family and more. The help text within the fields can also be customized. Select which fields are mandatory or not. Social icons provide further assurance to users about your product or service’s credibility. The builder provides ready made icons for facebook, twitter, google+, linkedin, pinterest, tumblr, instagram, youtube and github. You can edit the color, size, backgrounds and icon type. Icon types include standard, icons with borders, squared icons and circular filled icons. 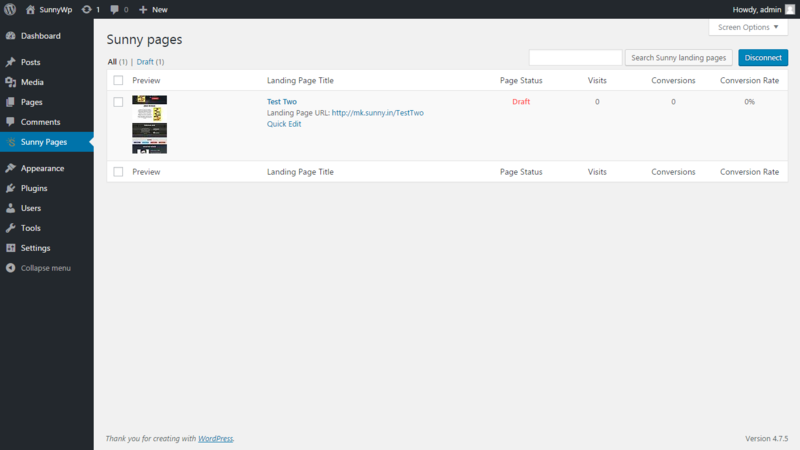 Here’s a snapshot from the social element module of the landing page builder. 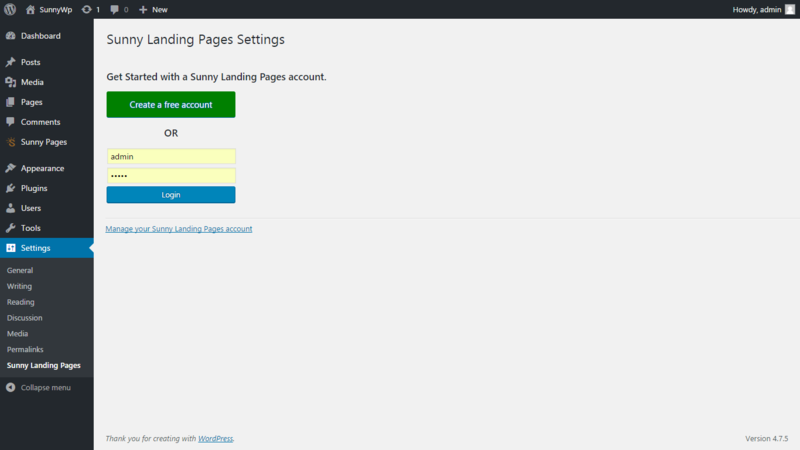 Sunny Landing Pages provides you with a hosted service so that you don’t have to worry about servers. You can focus on the content and conversions! We use Amazon Web Services for our hosting. Our experts ensure high availability – we are proud to say we haven’t had any unscheduled downtime till date. It’s important to keep testing the performance of the pages because a poor speed directly affects your Quality Score in Google Adwords which means you’ll end up paying a higher Cost per Click. We use Google’s developer tools (Page speed insights) to check all the themes and templates we build. Remember to optimize and compress your images before uploading to ensure the best results. From the dashboard, you can see how your pages are performing. You can also download a list of your leads in a CSV format. Remember, as long as you put the information in the form builder – you’re already getting real time notification of your leads on email as well. You gotta love them heatmaps. Awesome way to understand how your users are browsing. The intelligence is critical for you to be able to optimize your pages. It is a great tool to assist you in your A/B testing too. The builder follows the bootstrap framework and hence provides responsive pages by default. To be sure, before you publish you can check the page preview option in 5 different formats – desktop, mobile device (portrait and landscape) as wall as tablet device (portrait and landscape). Here’s a snapshot of our preview mode. Let’s face it – Building a page from scratch is hard. It’s much easier to have a starting point which you can customize instead of thinking through on each element. We’ve provided a library of ready made templates and themes. We’ve provided a categorization so that if you’re looking for Lead Gen pages, Coming Soon Pages, Real Estate Pages – or whatever, you can filter the category to select from the most suitable themes. Once you’ve selected a theme, it’s much easier to edit the content and tweak the layout for your needs. Last but surely not the least, the builder provides you with a dashboard to manage all your pages – add, edit, delete and publish. You can review their performance and administer all your account settings.